I was recently on a hike into what I believed was a fairly remote location only to discover that there was a strange construction already established there. It wasn't much of a structure, and I wasn't really certain what it had been intended for by it's maker; but it occurred to me that it could be put to use on a camping trip, and that the area would possibly be a great place to pitch camp. This strange construction was about the size of a grill for cooking food, but was square shaped and looked to have been formed to accommodate a shelf of some sort. What is very interesting about this type of structure is the geothermal properties that it entails.Back in the old days they used to build stone structures for temperature control. The thick stone is very dense and retains temperature which it loses slowly, dependent on the thickness. For instance, a home built with very thick limestone walls would gather heat from the sun over the course of the summer and over the course of the winter the dense stone would slowly release that heat, helping to control the inside environment by allowing the fire usually built inside to help it maintain a constant temperature. On the contrary, as the cold seeped into the center of the stone, it would be slowly released over the course of the summer, thereby giving a stone house a variable degree of frigidity. 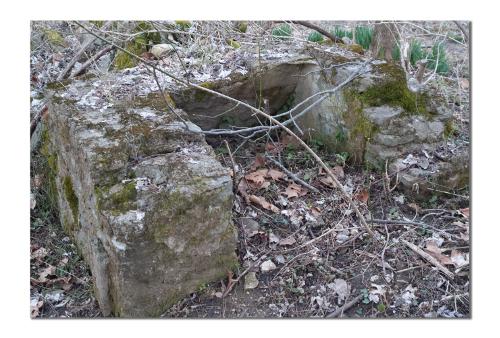 That being the case, it occurred to me that this small structure would make an excellent place to store provisions while camping, the stone structure would offer climate control while the stone construct would offer protection; with a little modification of course.